nShield Connect HSMs integrate with the unique Security World architecture from nCipher. With this proven HSMs encryption technology, you can combine different nShield HSMs appliance models to build a unified ecosystem that delivers scalability, seamless failover and load balancing. nCipher eSecurity has earned a broad set of certifications for nShield products. These certifications help our customers to demonstrate compliance while also giving them the assurance that their nShield HSMs meet stringent industry standards. nShield HSMs boast high elliptic curve cryptography (ECC) and RSA transaction rates. ECC, one of the most efficient cryptographic algorithms, is particularly favored where low power consumption is crucial, such as applications running on small sensors or mobile devices. nShield HSMs offers support for the majority of these cryptographic algorithms as part of the standard feature set. For organizations wishing to use ECC or South Korean algorithms, optional activation licenses are needed. Calculated at 25C operating temperature using Telcordia SR-332 “Reliability Prediction Procedure for Electronic Equipment” MTBF Standard. To meet the performance needs of your application, nCipher provides a variety of nShield Connect models as shown in the Specifications tab. You can select among the performance models shown, and can also purchase in-field upgrades from lower performance models to higher models. nShield Connect HSMs ship with three client licenses, each allowing a connection to an IP address. Additional licenses are available for purchase. The maximum number of client licenses supported varies by nShield Connect model as shown in the table below. nShield Web Services Option PackThe Web Services Option Pack enables the nShield Web Services Crypto API, which provides a simple interface between applications and nShield crypto services. The API gives cloud, data center or on-premises applications access to nShield data protection solutions without the need for client-side integration. nShield MonitornShield Monitor is a monitoring platform that provides 24×7 visibility into the status of payShield and nShield HSMs. With this solution, security teams can efficiently inspect HSMs and find out immediately if any potential security, configuration or utilization issue may compromise their mission-critical infrastructure. nShield Remote Administration lets operators manage distributed nShield HSMs—including adding applications, upgrading firmware, checking status, re-booting and more—from their office locations, reducing travel and saving money. 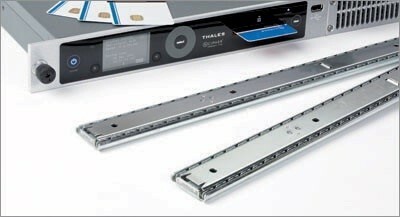 Remote Administration Kits contain the hardware and software needed to set up and use the tool. These kits are available for nShield Solo and nShield Connect HSMs. CodeSafeCodeSafe is a powerful, secure environment that lets you execute applications within the secure boundaries of nShield HSMs. Sample applications include digital meters, authentication agents, digital signature agents and custom encryption processes. CodeSafe is available with FIPS 140-2 Level 3 certified nShield Solo and nShield Connect HSMs. CipherTools Developer ToolkitThe CipherTools Developer Toolkit is a set of tutorials, reference documentation, sample programs and additional libraries. With this toolkit, developers can take full advantage of the advanced integration capabilities of nShield HSMs. In addition to offering support for standard APIs, the toolkit enables you to run custom applications with nShield HSMs. Database Security Option PackDatabases often contain an organization’s most sensitive data. To help customers protect their data, major database vendors have implemented native encryption in their products. The nShield Database Security Option Pack adds support for Microsoft’s Extensible Key Management (EKM) API, helping organizations to better protect the keys that safeguard sensitive data in Microsoft SQL Server. 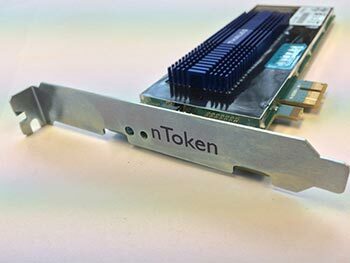 Security teams that want to strongly authenticate their nShield Connect HSMs clients can use nTokens PCIe cards to do hardware-based host identification and verification. Elliptic Curve Cryptography (ECC) activationThe ECC activation license enables EC-DH, EC-DSA and EC-MQV to be used on an nShield HSMs. KCDSA activationWith the KCDSA activation license, you can use the Korean Certificate-based Digital Signature Algorithm (KCSDA) as well as HAS-160, SEED and ARIA algorithms on an nShield HSMs. 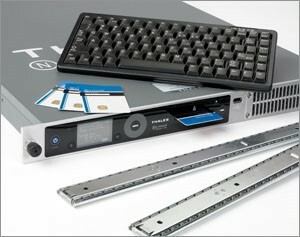 nCipher offers optional slide rails that let users mount nShield Connect in a 19″ rack without a shelf. nCipher recommends that customers use these slide rails exclusively as parts from other manufacturers may not be compatible. Many functions of nShield Connect HSMs can easily be executed using the touch wheel at the front of the unit. nCipher offers an optional USB keyboard for even greater ease of use.